If you're among the living, you may find yourself occasionally wondering whether you remembered to feed your pet. If it's a regular thing, you and Fluffy would benefit from an automatic pet feeder. With an automatic feeder, your pet can help herself. Among the many types of feeders, some are easier to build than others. If you're mechanically inclined, you could construct a high-tech "smart" dish that would feed your pet on demand or at scheduled times of the day. You don't necessarily have to have an engineering degree if you want to build your pet a state-of-the-art feeder, but it helps to understand electrical and mechanical systems and how to incorporate them into a feeder. You'll need a power source from batteries or an electrical outlet. With a mechanical feeder, you'll include a timer so your pet can eat on a regular schedule. You'll also need a motor to open the lid, turn the wheel or otherwise activate your pet feeder when the timer indicates it's dinner time. An automatic dispenser feeder will dole out a measured amount of food from a silo-type storage bin positioned above your pet's dish. Various designs accomplish this. Consider a paddle wheel below the opening at the bottom of the silo. Dry kibble will fill the space between two paddles each time the wheel advances. A timer activates the motor, which turns the paddle wheel only enough to advance one paddle. The kibble that was being held between the two paddles "in waiting" spills into your pet's bowl. 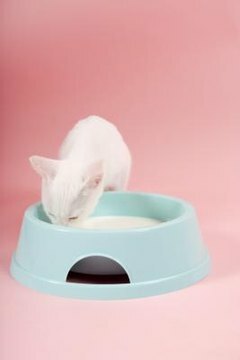 Plans for an automatic feeder can incorporate your pet's existing dish to control the time of day your pet eats, as well as limit the amount of time -- and therefore the amount of food -- he can eat. Essentially a frame surrounds the dish, and a lid is placed on top of it. The lid connects to an arm on a motor that will open and close it. The lid should be larger than the dish so it covers the top of the dish but extends past the back of it to attach to the frame. The lifting mechanism, placed under the extended part of the lid, connects to a motor for opening and closing the lid. A rotating coil is useful for the opening/closing mechanism because it will work like a screw, rotating up and pushing the lid open when it's dinner time, and then rotating back down to close the lid afterward. A latch on the edge of the front of the dish holds the lid closed before and after feeding time. A timer wired to the motor will kick the motor on when it's time to open the dish, and again when it's time to close it back up. If you're not the mechanical type and aren't worried about your pet free-feeding, an easy, low-tech automatic feeder can be made using a clean empty gallon jug or similar, larger container. Just fill the jug with your pet's kibble, then turn it upside down over his bowl -- gravity will take care of the "automatic" part. The opening of the jug or container has to be large enough to let your pet's kibble pass through with no trouble. If the kibble gets stuck you may have to enlarge the opening. Construct a simple frame to hold the jug over the bowl, as well as to keep it from tipping over. You'll have to do some measuring beforehand to get the positioning of the frame right. The container should be suspended so that the opening is about a half-inch to 1 inch below the rim of the bowl. You'll have to ensure that the container opening isn't too close to the bottom of the bowl. Experiment to determine at what height the feeder dispenses the kibble most effectively. Systems and Control Technology; Andy Biggs et al.